Perhaps you find that your natural grace and beauty is hidden by unwanted crow’s feet. Or you feel that you suffer from drooping eyelids and loose skin that frames your eyes, making you look slack and tired. Advancements in restorative surgical procedures have made it possible to revive your eyelids, giving you back a youthful, bright-eye look to your facial features. An eyelid surgery (also referred to as a Blepharoplasty) corrects any imperfections of the eyelid. Whether it is congenital or age related. Eyelid surgery can be used to treat a number of conditions that may impair one’s vision, or merely to improve upon facial imperfections, such as improving puffiness of the eyes, reducing wrinkles, and repairing upper and lower eyelid conditions. · Improving vision that is obstructed by hanging eyelid skin. · Attaining a more defined upper eyelid crease. · Lifting sagging upper eyelids. · Removing lower eyelid fat. · Reducing puffy bags underneath the eyes. Both men and women have greatly benefited from eyelid surgery. In fact, eyelid surgery in New Jersey is quickly becoming one of the most popular cosmetic procedures requested. Dr. Joseph A. Racanelli performs cutting-edge techniques to treat excess fatty deposits of the eyelid, sagging and loose skin, wrinkles of the lower lid, bags under the eye, and more. With innovative blepharoplastic procedures, Dr. Racanelli can restore your natural eyelid contour and improve your eye’s natural features. With the delicate skin that surrounds your eyes, along with the demanding intricacy of the area and safety precautions, it is important to select a surgeon who has the necessary experience and skill, when performing your eyelift surgery. Dr. Racanelli strives to give his patients the best eyelid surgery New Jersey can provide. As one of New Jersey’s leading eyelid surgeons, Dr. Racanelli takes a special interest in Blepharoplasty. Understanding the delicate nature of the eyelid area, Dr. Racanelli blends his years of surgical expertise with innovative techniques, in order to create the most natural looking results. 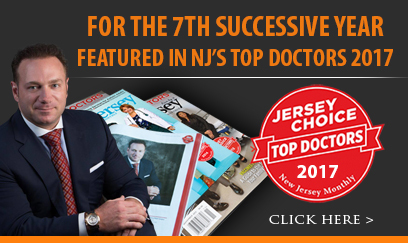 His comprehensive knowledge, care for his patients, and attention to detail continue to distinguish his practice from the rest of the New Jersey medical community. These distinguishing qualities make Dr. Racanelli one of the top choices for eyelid surgery New Jersey has to offer. After your eyelid surgery, applying cold compresses for the first 24 hours can help to minimize swelling and bruising. Additionally, it is very important to keep your head elevated as much as possible during the first week or so. Sleeping in a recliner or with extra pillows behind your head helps immensely. Routinely, patients feel able to return to work within a week up to 10 days. About 3 weeks to 5 weeks after the procedure, patients may be allowed to resume strenuous exercise routines. Eye drops can help with any discomfort you may be dealing with. Above all, it is important to address any questions you have to Dr. Racanelli, regarding your procedure. If you’d like to learn more about having eyelid surgery in Brooklyn or New Jersey, request a consultation online. Or feel free to call Dr. Racanelli’s office directly at (888) 982-3309 and one of our staff members will assist you.